I don't have anything new to report this week, just a bit of progress on my Nimue wrap. 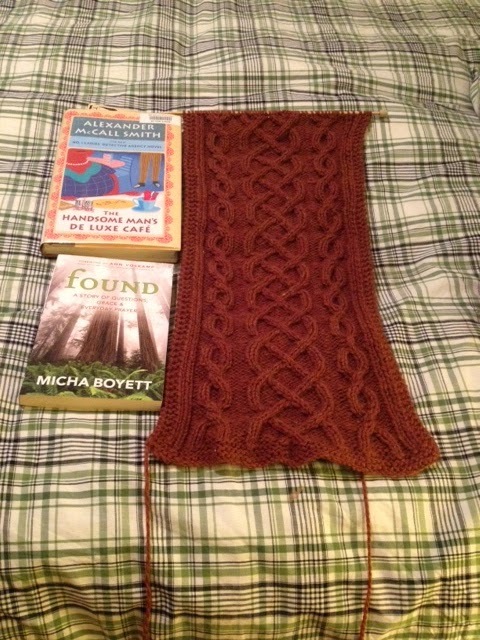 It is going to need some blocking to make it look more wrap than scarf but I LOVE the cables. It's a pattern that I have to watch pretty closely since it would be so easy to make an inattentive mistake but so far, I have only had one disaster and that was early on. I LOVE cables and this rust colour will be a lovely thing to wear next fall. I'm still reading The Handsome Man's De Luxe Cafe by Alexander McCall Smith (from the No. 1 Ladies Detective Agency series) and Found by Micha Boyett. The Handsome Man's is o.k. - I love this series and this author but I'm tired enough that I don't get many pages in before I doze off. I LOVE Found and feel a bit like I have finally found someone who feels the things that I do and it is so refreshing. I haven't made much progress in it this week, though - I'm doing an online course right now and I am up to my eyeballs in teacher-related reading. It's interesting but not really fun! I'm liking up to Ginny over at Small Things and can't wait to see what everyone else has been up to this week!